Álvaro Zambrano began his musical studies, in piano, at the Jorge Peña ‘experimental’ Music School in La Serena, Chile and later studied singing with Ahlke Scheffelt at the Pontifical Catholic University of Chile, during which time he gave concerts and took part in masterclasses with the Chilean soprano, Cristina Gallardo-Domás. Between 2009 and 2012 he studied at the University of Music Freiburg with Prof. Reginaldo Pinheiro, where he took part in various opera projects, directed by Prof. Alexander Schulin, during the summer semesters, including Joseph Haydn’s La Fedelta Premiata (singing the role of Fileno) and Donizetti’s L’Elisir d’Amore, in which he sang the role of Nemorino. He has given numerous recitals, at the Theater Freiburg, in Padua and Granada, and, in August 2010, he performed in Benjamin Britten’s The Beggar’s Opera in Konstanz and made his début the following year as Tamino in The Magic Flute in Zaragoza, Spain. He has been the recipient of a scholarship awarded by the Helene Rosenberg Foundation Freiburg as well as a laureate of the Commerzbank Foundation’s Gustav Scheck Competition. 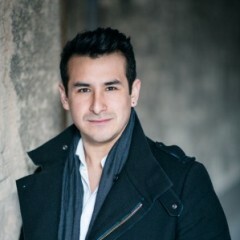 During the 2012-2013 season Álvaro Zambrano was engaged at the Deutsche Oper Berlin on a scholarship awarded by the Patrons of the Deutsche Oper Berlin and since 2013-2014 he has been a member of their ensemble, performing roles such as Tamino, Fenton (Falstaff), Prunier (La Rondine), Gaston (La Traviata), Matteo Borsa (Rigoletto), Spoletta (Tosca) and Nemorino (Der Liebestrank). Most notably, he has sung Tamino at the Leipzig Opera, Prunier with the Münchner Rundfunkorchester, and, most recently, a concert programme with the Antwerp Symphony Orchestra.